ZO Skin Health was founded by Dr. Obagi in 2007, and was created to provide physicians and patients with the world’s most innovative and effective skin health solutions. As Medical director of ZO Skin Health, Dr. Obagi has created products with technologically advanced ingredients and even more effective formulations, designated into two categories: ZO® Skin Health and ZO® Medical. ZO® Skin Health products maintain the results of therapeutic treatments and provide effective daily skincare and protection from the environment, while ZO® Medical products have been optimized to treat a range of skin disorders and chronic conditions. Dr. Obagi’s philosophy is to create & maintain healthy skin for life – for all patients. Our products are formulated & developed to do just that. Guided by Dr. Zein Obagi, a practicing dermatologist, ZO Skin Health’s product development team is constantly reviewing market trends, sourcing new ingredients and formulating products that will provide you with visible results. 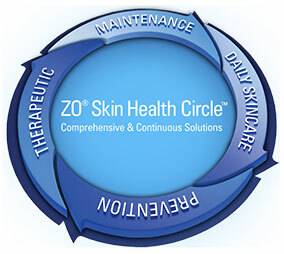 How long does it take to see results from using ZO Skin Health products? Generally it takes 6 weeks for adjustment and tolerance, but you can begin to see cellular turnover within 2 weeks. As you continue to use ZO, more dead layers are exfoliated, brown spots diminished, skin texture becomes smoother, fine lines and wrinkles reduced. Retinols or Retinoic acids are a must for keeping your skin youthful, bright, healthy and toned. Dr. Zein Obagi’s ZO Skin Health line of products has given our patients a range of wonderful options for Retinols, Retinoic acids, anti-oxidants and growth factors. What is the difference between Retinol and prescription Retinoid products? A: Both come from Vitamin A but the difference is how they penetrate in the deep layers of the skin to create cellular turnover. Retinol penetrates the cell walls easier than Retin A or Retinoic acid. Retinols convert to Retinoic acid inside the cells. Retinols tend to be easier to tolerate than Retinoic acid causing less irritation. Retinols come in varying strengths like Retinoic acid, so the higher the strengths the greater their effectiveness. Both Retinol and prescription Retinoid products are used in the ZO Skin Health products. What is the Retinol within ZO Skin Health most beneficial for? Retinols and Retinoic acid in ZO Skin Health products are effective to exfoliate the outer layer of skin and preventing build up of dead layers of cells. Both create growth of healthy cells, exfoliate the dead outer skin layer, reduce brown spots for even skin tones and diminish signs of aging.